“Great Society” was a term coined by President Lyndon Johnson. 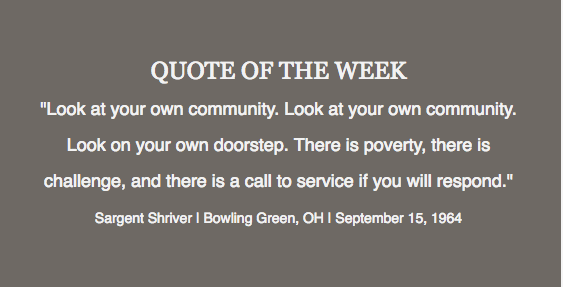 It encompassed a broad range of domestic programs and policies, including Sargent Shriver’s War on Poverty programs. The Great Society's overall goal was to open up education, health care, civil rights, and economic opportunity to groups who struggled to access them, either because of discrimination, financial hardship, or other disadvantages beyond their control. “For we cannot create a Great Society without Great Citizens,” says Sargent Shriver in the speech. And to be a great citizen, one must have the willingness to serve others. We invite you to read this dynamic speech. In it, Sarge draws from his experiences with the War on Poverty as well as the Peace Corps to show examples of citizenship and service. His words serve as a reminder that our moments of greatness occur when we reach beyond ourselves to create stability and prosperity for all of us – particularly for our most vulnerable brothers and sisters.